Threats of violence and even death are being used to stop UKIP from campaigning for the general election as the hard left try to stamp the party out. Groups including ‘Stand Up To UKIP’ have warned UKIP candidates not to turn up to hustings while activists claim to have been spat at in the street, the Express reports. 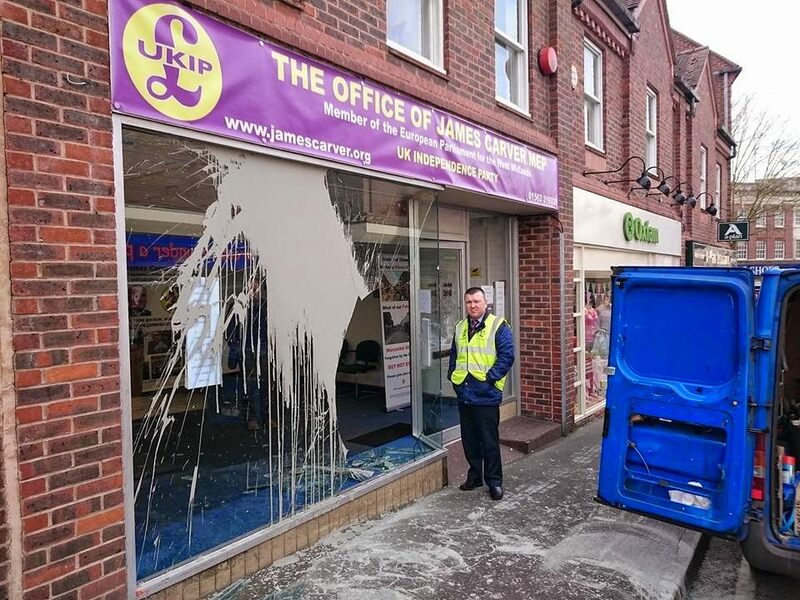 And across the country, campaign offices have been vandalised, with socialists boasting on twitter they would even set fire to a shop with UKIP supporters still inside it. An anonymous letter was set to a candidate in West Lancashire threatening him if he turned up to a hustings event – a key mechanism in Britain’s democratic process. Mr Sen said: “I would have loved to go to the hustings, but I’ve been warned that because it was a co-ordinated letter, it’s high risk for me and my family. In Great Yarmouth, police were called after residents of Northgate Street in the town were visited by a group of four men insisting they remove their UKIP poster on their windows. When the home owners refused to do so, they were threatened and eventually took the posters down – before the men drove off. The seat was a key target for UKIP before its young candidate, Matt Smith, had to resign over allegations he has since been cleared of. His replacement, Alan Gray, is still doing well in the polls but is unlikely to win although the party should pick up local council seats. However, this did not stop thugs driving past the house where he and his wife, who are both councillors on Great Yarmouth Borough Council, live, shouting “If she opens the door, shoot her!”. The police are said to be investigating the incident having spoken to Mrs Gray. The Labour party in the constituency have also been accused of inventing fake UKIP policies as they try to win the coastal seat from Conservative Minister Brandon Lewis. Lynne Connell, a local branch member, told Breitbart London a previous voter who had pledged his support to the party changed his mind after being told that UKIP would ‘get rid of disabled people’. Mrs Connell, who has two disabled grandchildren, explained this was not UKIP policy but was called ‘a Nazi and a liar’ by the man and left shaken after the incident, which she reported to the police. 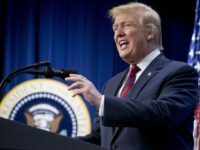 “Now they also appear to be so afraid of our excellent manifesto and pledges regarding welfare and disability they now stooping lower than ever before,” she told Breitbart London. Norfolk police confirmed they had investigated the incident. Another candidate was subjected to “murder” threats via internet trolls who threatened to firebomb his home. Alan Harris, the party’s candidate for Oxford West and Abingdon, was accused of making homophobic comments on line, something he strongly denies. West Yorkshire police have confirmed they are investigating an incident by Bradford East candidate Owais Rajput who was allegedly pushed by rival party supporters at the weekend as he attended a husting at Bradford Cathedral. 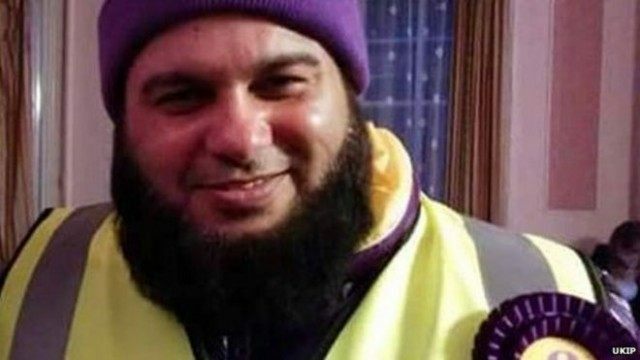 He says he was also verbally abused at the event, which he attended in support of fellow UKIP parliamentary candidate for Bradford West, Harry Boota. Party leader Nigel Farage has refused to answer questions about whether he has personally received death threats, although his house in Kent is monitored by CCTV cameras and the leader has to travel with a close protection officer, something he says he “hates”.